The portable tractor shed is designed as a tractor garage, to house a small tractor and several implements. Other things can also be stored such as animal feed, logs or even livestock. It is cheaper than a container, does not have the same problem with condensation, it can easily be moved and does not require a crane for installation. Approximate sizes:- Length 3m, Width 2.3m, Height 2.2m. Other sizes are available with higher roofs if required. It is possible to join two tractor sheds side by or end to end, in fact any number can be linked to cover a larger area. A strong box profile steel frame, covered with juniper green, country clad polyester coated steel sheeting. It is mounted on skids with four steel towing eyes, so it can be pulled forward or back with a tractor or other towing vehicle. A single wide hinged door gives more than a two metre wide opening for easy access and can be secured with a padlock. 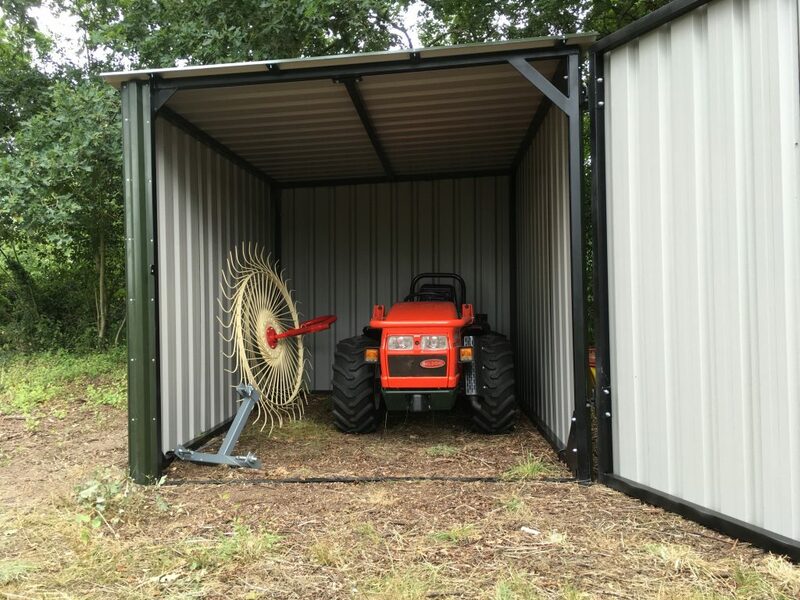 The tractor shed is portable and so does not come under normal planning constraints and the compact size and green colour allows it to blend in with the countryside. It can be moved easily on it’s steel skids and as such, can be placed on any piece of level ground in the most optimum position for sun and wind in the field or yard. The tractor shed can be supplied partly or fully assembled. A delivery and assembly service is available and multiple units can be joined together. Price:- Fully enclosed shed with a large hinged door £1680 +vat.